This is my version of the original ‘jeere- mire chicken’. I found this rather unusual dish in Nana’s recipe book but it was more ‘a notes to myself’ page than a recipe. I’ve substituted prawns for the chicken, but used all the other ingredients described. I made up the measurements as I went along as these were conspicuously absent in the original notes. I don’t have anything to compare it with, but I quite liked the kick of the pepper along with the heat of the red chillies. I have added some curry leaves which aren’t in the original notes. The spice mix is quite similar to some of the other Goan recipes that call for ginger-garlic and chillies to be ground together with cumin and a splash of malt vinegar. It’s quite a heady aroma, so I wouldn’t recommend trying to sniff it while you’re grinding the masala. It can set off a proper sneezing fit. It is quite a fiery dish and I would highly recommend balancing it with some milder accompaniments. I imagine that Nana might have served this with some coconut rice but we will never know. Grind all the ingredients for the spice paste with a 2 tablespoons water. You need a smooth paste. Marinade the prawns with the paste and add some salt. Keep aside. Heat the oil. Add the curry leaves and the onions. When the onions are caramelised add the tomato paste or chopped tomato. Cook till the tomatoes are mushy and the onions and tomatoes have come together. Add the prawns along with all the spice paste they were marinaded in. Add 1/4 cup of water and cook on high till prawns are done and the water has evaporated. 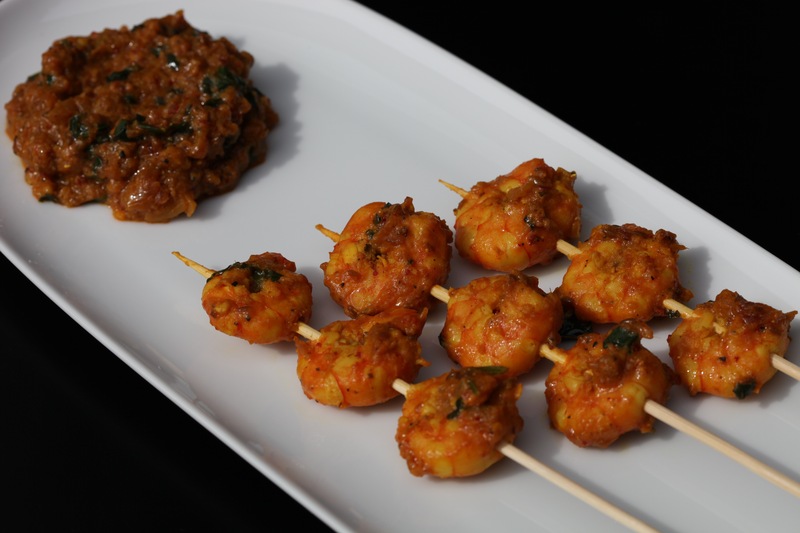 To serve this as a curry simply add more water when cooking the prawns. This entry was posted in A-Z 2016, Fish, Goan cuisine, Gravy dishes, Seafood and tagged #AtoZchallenge, epicurious, goan cuisine, goan spicy appetisers, Goan spicy prawns, jeere mire prawns, malt vinegar, Mumsnet Blogging Network, prawns, spicy appetisers, spicy prawns, Yummly. Bookmark the permalink.